Janie Brookshire, Ben Diskant and Karl Miller in A Delicate Ship. Photo by Sandy Underwood. What does it say about a play when you find yourself crying the entire trip home? A DELICATE SHIP is a deeply affecting and beautifully sad memory play elegantly staged by Michael Evan Haney at the Cincinnati Playhouse in the Park. Set in a modern apartment, we meet a couple named “Sarah” (Janie Brookshire) and “Sam” (Ben Diskant) and an eccentric man named “Nate” played by Karl Miller. Immediately, Miller held my rapt attention with the way he broke the fourth wall making eye contact with the audience and engaging us in this retelling of a Christmas Eve some time ago. Nate, you see, is the childhood best friend of Sarah . . . and yet Sam has somehow never heard of him. I won’t spoil the plot for you but I will tell you to take some tissues. There are some funny lines, but this is not a happy show. But wow . . . is it ever powerful. All three actors have great presence on stage but I was especially taken with Miller’s work. He has some very difficult monologues and chose (or was directed) to speak some of them so rapidly that if you weren’t paying attention you would miss their dark beauty . . . but because of the actor’s energy, you really can’t help but pay attention to him. He has some sort of charisma that is rarely seen on stage. Diskant was a less relatable character for me personally, however I found myself choked up by him a few times. His personality reminded me just a little of the friend who was seated next to me and perhaps that was what prompted my emotional response or perhaps it is the actor’s sincere connection to the character but I was genuinely moved. Brookshire is quite likable and she made it easier to empathize with the character tolerating some bad behavior from her old friend longer than anyone should or would have. All in all, this is a very well acted piece. The language is often poetic and there are some really briskly spoken but deeply poignant lines. 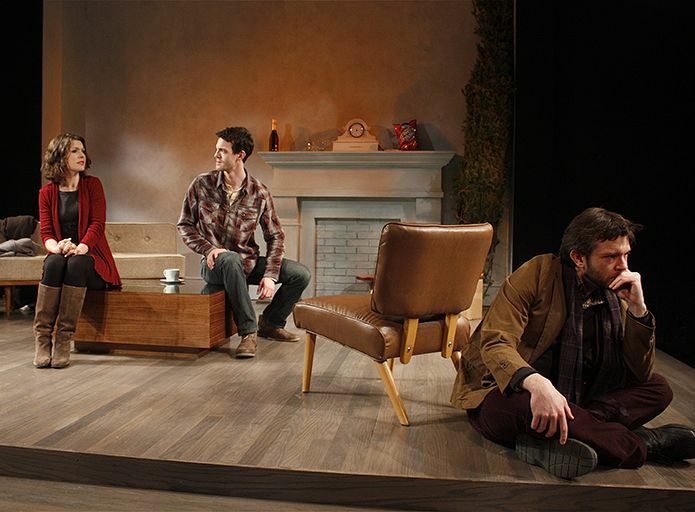 The minimalistic set balances the depth of the relationships, which develop quickly and are communicated with ease throughout the show. My only complaint might be what seemed random-at-times lighting changes that didn’t always mirror the shifts in time and place that were occurring. It all happens so fast, though, that perhaps I was just trying to hang on. The show is only 75 minutes long and I wonder if slowing things down might have allowed me and the actors to savor some of those brilliantly written lines but then again with a story this emotional perhaps it’s good to hit us hard and fast and allow us to process it all on the car ride home. I’d rather cry alone than in a theatre, I guess, but tonight’s case I did both. A DELICATE SHIP runs through April 20th in the Thompson Shelterhouse Theatre at the Cincinnati Playhouse in the Park. More information and tickets are available here.